Decorating a small kitchen involves a series of tactful steps to ensure all essential elements to make it functional and stylish are included. There are a variety of tactics you can use to decorate a small kitchen, which can include painting the walls with light colours, making space by minimizing large pieces, hanging pendant lighting fixtures and fixing large tiles on the floor. You shouldn’t waste any space here which is why you should look for modular furniture pieces that will store utensils, crockeries and other necessary items. 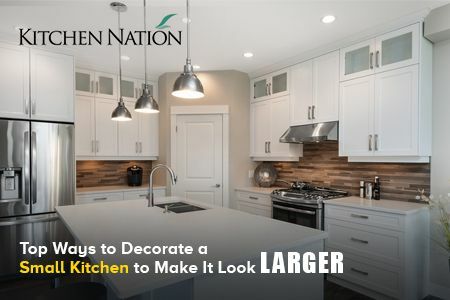 If you are looking for ways to decorate a small kitchen to make it appear bigger, this blog post by Kitchen Nation is meant for you. Read on to explore ways to make the most out of this space. A secret to making a room look larger is to paint the walls with a neutral or white colour. Light shades will help reflect light in this space and make it look bigger. If you’re fond of dark colours, use them only when selecting accent pieces such as kitchen appliances. Otherwise, keep them in other rooms of your home. Instead of occupying the entire countertop with a large sink, select a smaller design and fix it in a corner. This way, you can save a lot of space and free other parts of the kitchen to prepare food. This will also help your area look clutter-free. If you have a small kitchen, don’t overcrowd it with a large amount of kitchen elements. All you need to create a functional space is a countertop, kitchen cabinetry and a place to prepare food. If you still have space after including all of these items, adding a kitchen island is a good option. Pendant lighting fixtures are the best way to brighten up a small space as they focus on a particular area, which makes cooking easy. When you choose the design, make sure they are light, as heavy and loud lights can weigh down a room and make it look smaller. Small kitchens, commonly known as corridor kitchens, are generally created using a galley style. It features a hallway between two parallel walls, with one side consisting of a sink, stove and a microwave, and the other side including cabinets and a preparation area. This layout is perfect for making your kitchen look spacious. Select filler cabinets with sliders to store all kitchen essentials without occupying extra space. You can also choose wall cabinets that reach to the ceiling to provide you with more storage. Large floor tiles make your kitchen appear bigger, unlike small tiles that can make a room look awkward. Choose tiles that are 12×12 inches and contain fewer grout lines. If you have a galley style kitchen, opt for large stone flooring style to achieve the same look as tile. If you have a small kitchen space and are looking for ways to make it appear larger, follow the above-listed recommendations. 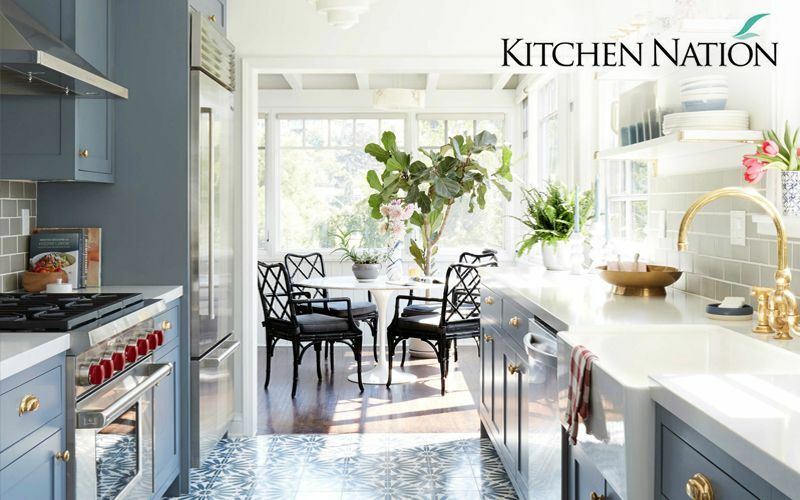 You can contact the experts at Kitchen Nation for more ideas on kitchen renovations.